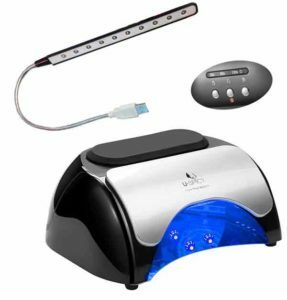 The MiroPure UV lamp uses 36-watt LED light beads, which can dry all types of gel polishes. The light beads are completely safe for your skin and eyes, and they have a lifespan of 50,000 hours. The lamp comes with two nail files and a cleanser to wipe the sticky residue off your nails once they dry. One of the MiroPure’s best features is its auto-sensor. The lamp detects when you put your hands out, and it automatically turns the heat on. Then, when you remove your hands, it shuts the heat off. This means that you won’t waste a second of the light beads’ lifespan, and you don’t have to risk messing up your nails by pressing buttons before they dry. Users praise how quickly their gel nails dry while still maintaining the color and brightness of the polish. Some lamps will make the polish look dull or lackluster as it dries, but the MiroPure keeps the original color and shine. Most types of gel nails only take 30 to 60 seconds to dry. The MiroPure lamp has four timer settings for 10, 30, 60, and 99 seconds. Keeping your nails under the lamp for longer than your gel polish needs could affect the color and quality of the polish, so you should be careful. You can choose your setting depending on the instructions on your gel nail polish. When you use the 99 second setting, the lamp gradually heats up, which prevents pain or discomfort while the gel hardens. 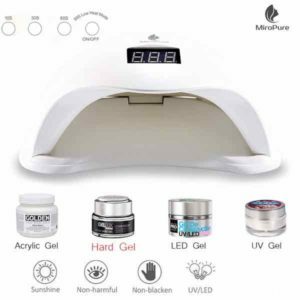 The MiroPure is one of the faster nail lamps available because it’s wide enough to dry your entire hand at once. However, this means that it isn’t as small and compact as some other nail lamps. It measures 9 by 8 inches and weighs about 2 pounds, so it would take up some significant space in your bag if you needed to travel with it. A few reviewers also complain that the lamp gets too hot and causes some discomfort. To avoid this, you may need to stick to the 99 second timer setting that lets the lamp gradually heat up. Overall, the MiroPure 36W is a top-notch nail lamp. It works quickly and safely, and it maintains the color and quality of your nail polish. If you’re okay with using a slightly heavier and larger lamp, the MiroPure is a great choice. 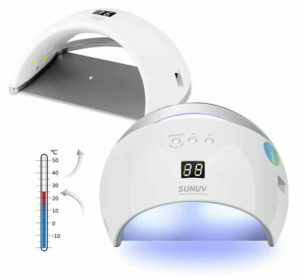 The SUN9C uses a combination of UV and LED light, so it can dry almost all types of gel nail polishes. Like the MiroPure, the LED lights will last for 50,000 hours, which is more than five years of continuous use. Instead of the typical purple light, it uses a white light that’s safer for your eyes and skin. The lamp is only 24 watts, but it will dry your nails quickly and quietly. The low wattage protects your skin from drying out or getting burned. The SUN9C has a unique shape and structure that allows it to be small and portable while still able to dry your entire hand at once. It has an arch shape, so it will provide light from almost 180 degrees. It has an open design, too, without a tray or any inner compartments. The lamp weighs less than a pound and measures about 8 by 3 inches. Depending on what your gel polish requires, you can either set the lamp to 30 seconds or 60 seconds. It uses an automatic sensor to turn the lights on when you put your hand in, so you won’t mess up your nails by pressing buttons or fiddling with timers. If you don’t set the timer before putting your hand under the lamp, it will stay on for two minutes before automatically shutting off. Although the SUN9C is small and easily portable, you might be limited in where you can set it up because the cord is only about 3 feet long. You’ll either have to get an extension cord or only be able to set it up right next to an electrical outlet. Some reviewers mention having to repeat the drying process several times before the gel completely hardened. This may be because of the lamp’s low wattage, but you should keep in mind that it’s normal for gel nails to have some sticky residue after drying. Once you wipe it off with a cleanser, the polish underneath should be completely dry. Despite a couple minor issues, the SUNUV SUN9C has over 1,000 positive user reviews. As long as you apply the gel polish properly, it should last just as long as a professional manicure. It’s less expensive than most UV nail lamps, but the quality holds up. 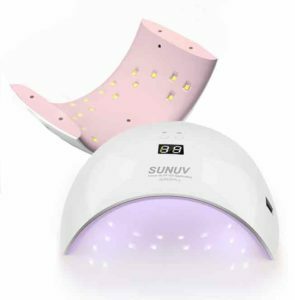 The SUNUV SUN6 uses white LED lights that dry your nails without damaging your eyes or skin. The lights work on all types of gel polishes, and you’ll never have to replace them. According to the manufacturer, the lamp dries gel nails in just 40 percent of the time a traditional nail lamp takes. It weighs about 1 pound and has a built-in handle for easy carrying. The SUN6 is very similar to SUNUV’s SUN9C. It has the same open arch shape that provides UV light from a wide angle, and it uses an automatic sensor to detect when your hands are under the lamp. You can easily fit your whole hand or foot under the lamp for fast drying. The SUN6 has a few nice upgrades over the SUN9C, though. The wattage is a bit higher, so it can dry nails more quickly. The lamp has an LCD display screen that shows the timer countdown. It also has an additional timer setting, so you can set the lamp for 30, 60, or 99 seconds. The 99 second setting uses the Low Heat Mode feature, which is good for hard gel or builder. The only reported issue with the SUN6 is that it tends to get too hot after a few uses. To avoid pain or discomfort, it’s important to make sure the gel polish is only on your nails and isn’t touching your skin at all. Some heat is to be expected, but if it becomes painful, you should turn the lamp off and consult the instruction manual to make sure you’re using it properly. The SUN6 is an excellent nail lamp for its cost. Reviewers say that it fully dries almost all gel types in under a minute, and it has a simple and intuitive setup. The manufacturer offers a 12-month warranty on the product, so they’ll help you out on the off-chance you have a problem with the lamp. The MelodySusie 48W is one of the highest-rated UV nail lamps available. It uses 18 LED lamps that are evenly spaced throughout the device for fast and consistent drying. 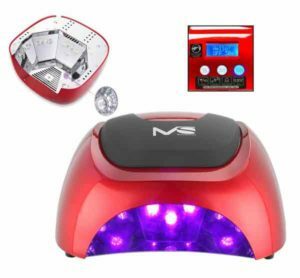 The LED lights are compatible with most types of gel nail polishes, and the 48 watt lamps are powerful and fast-acting. One of its greatest features is its ventilation system. With most other nail lamps, the lights can get hot quickly, which can become uncomfortable if you need longer than a minute to dry your nails. The MelodySusie’s ventilation holes prevent your hands and nails from overheating. It has a magnetic removable base, so you have space to dry your toenails as well. The MelodySusie has three timer settings at five, 20, and 30 seconds, but it also has an automatic motion sensor. If you don’t set the timer, it will automatically turn on and off when you slide your hand in and out. The lamp is on the larger and heavier side, so it might be inconvenient to carry around. However, this means that it’s durable. You should still be careful, but the lamp can probably handle some minor falls and accidents without breaking. Some users have problems with the timer because the longest setting is only 30 seconds. This isn’t long enough to dry some types of gel polish, so you’ll have to keep resetting the timer. Also, the sensor is very sensitive to hand and finger movement, and it can be difficult to keep your hands completely still under the lamp. If you twitch or move your fingers, the lamp will think you’re removing your hand, and it will shut off. The MelodySusie 48W is more expensive than the other nail lamps on this list, but the cost isn’t unreasonable for the quality. Some professional nail technicians even say that the MelodySusie works better than their professional, salon-quality lamps. It comes with a six-month warranty, but it’s unlikely that you’ll run into any issues during this time. If you’re willing to pay a little extra, the MelodySusie is worth it. The USpicy 48W uses a combination of LED and UV lighting, so it’s compatible with almost all gel nail polishes. Most nail lamps that use both LED and UV lighting use dual bulbs, but the USpicy lamp uses separate LED lights and a CCFL coil for UV light. This helps the lamp dry the gel polish quickly and evenly. The lights should last for years without needing replacement. The USpicy 48W has three timer settings at 30, 60, and 120 seconds as well as an automatic setting that turns the lamp on or off when you put your hands in or out. The tray detaches, which creates enough space for you to dry your toenails. It comes with a pull-down covering that will protect your eyes from damage, although you should still be careful not to look directly at the light. The lamp weighs just over 2 pounds and measures 8.5 by 7 inches. The purpose of the lamp is to dry your gel nails, but you can also use the device while applying the nail polish. It has an extra USB LED light for better illumination, which you can use to paint detailed designs before drying. The light hovers over the top of the lamp, so you can rest your hands on top of the lamp while painting your nails. There’s a pillow built into the top of the device, so your hands will rest comfortably. A few reviewers mention that the lamp is a tight fit when trying to dry the entire hand at once. If you have larger hands, you’ll probably have to dry your thumb separately, which will take some extra time. Another small issue is that the buttons are all placed on the back of the lamp. Until you get familiar with the device, you may have to fumble to find the right button or flip the lamp around. The USpicy 48W is designed both for amateurs and for professional nail technicians. It’s easy for beginners to use, but it provides professional-quality results. Reviewers say that the lamp maintains the color and shine of the gel polish, even after two minutes of drying. Not only is it good for drying gel nails, but it also has several features that make applying the nail polish easier. If you want a lamp that makes the entire nail-painting process easier from start to finish, the USpicy 48W is one of the best options. The two most common types of nail lamps are UV and LED. You can check your gel nail polishes to see whether they’re designed for UV or LED lights. UV light has a wavelength of 100 to 400 nm and LED light has a much narrower wavelength of 400 to 410 nm. Because UV light emits such a broad wavelength, it works on UV and LED nail polishes. However, LED lamps only work on LED polishes. They can’t dry UV polishes. Many nail lamps include both LED and UV lights, so you don’t have to worry about the type of polish. You should make sure to buy a nail lamp that’s compatible with your preferred polishes, though. If you buy a lamp that only has LED lights, you’ll be limited to LED gel polishes. Fortunately, most gel polishes are formulated for LED. The curing speed is the length of time it takes to dry your nails. You don’t want to wait forever for your nails to dry, especially since some UV lights can be harsh on your skin. LED lamps are generally faster than UV lamps. LED lights should cure and dry your polish within two minutes, but UV lights may take up to five minutes. The exact curing speed depends on the type of polish. The timer settings on the lamp can give you an idea of how quickly it works. If the lamp sets a timer for two minutes, you can expect it to take that long for your nails to dry. If the longest setting is only one minute, the manufacturer is probably confident that it only will take a minute for the gel nails to dry. However, it’s definitely possible for the curing speed to be longer than the timer settings for some types of polish. Nail lamps typically range from 12W to 48W. The higher the wattage, the faster and more powerful the lights will be. Anything less than 20W will probably be too slow. Higher wattage lamps will be more expensive, though. Anywhere from 24W to 36W should dry your nails quickly without being too pricey. If you have a higher budget for a professional quality lamp, it might be worth it to get a 48W lamp for the faster speed. If speed is one of your priorities, you should get a nail lamp that’s big enough for your entire hand. Some are too small to accommodate your thumb along with the rest of your fingers, so you need to go through more than one round of drying. Larger nail lamps will also work well for drying your toenails. Although you’ll want a lamp large enough for your whole hand, you also may want one that’s small enough to be portable. If you plan to set your lamp up at home and keep it there, portability doesn’t really matter. However, if you want to bring it with you when you travel, you should choose a smaller and more compact model. Every product on this list has positive reviews from hundreds of happy users. They should all do a good job of drying gel nails, but you have to decide which will be best for your manicures. If you like small and compact lamps, the SUNUV 9C or SUN6 are both good options. If you want a more powerful lamp, the MelodySusie 48W or the USpicy 48W might be better. If you’re not sure exactly what you want, the MiroPure 36W is one of the best all-around products. Whichever lamp you choose, it’s important to use it properly and take good care of your nails. Make sure there isn’t any gel on your skin before putting your hand under the lamp. Most LED lights are safe for your eyes, but you should still avoid looking directly at the lamp when it’s on. As long as you’re safe and careful, you should end up with beautiful gel nails.